The Phillies and the Mets have been wearing this year’s special edition cap that we saw worn on Memorial Day and now again this weekend. 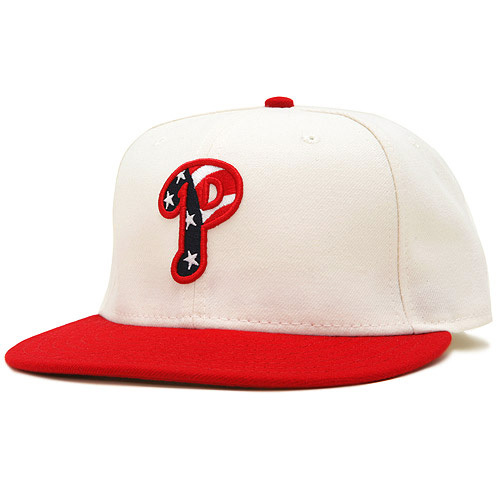 The all white cap features the team’s logo in the flag colors of red, white, and blue. Today is Independence Day, the celebration of the birth of the United States as a nation. You can get one through July 18th at MLB.com's Shop with Free shipping! Last night, the Phillies opened up on the Pirates with a 12 run barrage that we know they are capable of doing quite a lot. The first two games in Pittsburgh resulted in losses and it really started to make some people feel that this year maybe isn’t the year for the Phillies. The injuries, and bad breaks have maybe finally caught up with them. Today, the Phillies will try to leave Pittsburgh splitting the series 2-2. The Phillies have had some great play out of Wilson Valdez in the past few weeks, now they have called up a minor leaguer named Cody Ransom to play third base a little for the Phillies. Cody has been around baseball for years, he played for the SF Giants, Houston Astros, and the Yankees. He was signed by the Phillies on December 14, 2009 as a free agent. Joe Blanton has been having a rough year, not all your pitchers on a staff are going to pitch greatly though, and Joe is going through one of those years you may want to forget about. In 11 games started so far, Blanton is 3-5 with a 6.19 ERA. He came to the Phillies two years ago around the trade deadline on July 17, 2008 from the Oakland A’s. Could he be departing via the same trade deadline from the Phillies this year? The Phillies have been said to be in the market for a pitcher, so the names Kendrick and Blanton come to mind as possible trade candidates. I think the Phillies want to keep ‘Country Joe’ as he is known, but we’ll see as the ‘hot stove’ in the trade deadline starts to heat up.